The Post Office Design Lab is a private testing environment to help develop new products and services using self-service, automation and digital technologies. The colourful space at LSBU contains booths where customers could get specialist advice via a video call, tablets for self-service, and a series of parcel drop-off points to speed up the process of posting, collecting and returning mail. 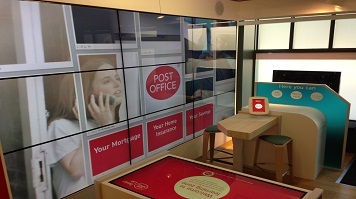 In a model that is proving successful for retailers such as Apple and Argos, traditional counters are gone in favour of "roaming" staff with tablets, while large touch-screen tables and wall panels are designed to encourage people to discover Post Office services and products for themselves. The Design Lab will test which elements can be incorporated into various Post Office branches and models, all designed to improve the customer's experience and choice over how they access Post Office products and services. While the Design Lab is not open to the public, the Post Office is looking at working with the university's academic staff and students to trial new services and systems. The Clarence Centre is the embodiment of LSBU's commitment to entrepreneurship and industry, offering students office space alongside established businesses for excellent networking and knowledge sharing opportunities. Post Office Corporate Affairs Manager David McConnell said: "We wanted somewhere that could support our plans to develop a more agile, collaborative and innovative approach to product and service development. The Clarence Centre at London South Bank University offers us the chance to develop and test projects with student entrepreneurs and departments, as well as specialist local small businesses. The facilities are superb, and being located in central London it supports our need to easily bring together colleagues, commercial partners and external stakeholders." LSBU Vice Chancellor David Phoenix added: "We are extremely pleased that the Post Office has chosen to use London South Bank University as the testing ground to develop a range of new technologies. This exciting project will underpin the development of new business models and the partnership is a testament to our reputation as a university that understands the needs of business and where teaching and research have real world impact."